Power products are practically a dime a dozen, with most costing far more than a dime while offering about that level of performance, but don't despair. There is one power conditioner on the market that delivers: the PowerWave 10 from Transparent. Better known for audio/video cables, Transparent has been making top-flight power conditioners for years now and the PowerWave 10 reviewed here continues in that tradition. Retailing for $1,695, the PowerWave 10 isn't the cheapest power conditioner on the market, but rest assured that every dime of its asking price was spent on what matters most: performance. • Read more AC power product reviews by the HomeTheaterReview.com staff. • Find source components, AV receivers, and amplifiers to plug into the PowerWave 10. The PowerWave 10 features a heavy-duty aluminum chassis with substantial bracing that helps fend off vibration, which can introduce coloration into your system's sound. The PowerWave 10 possesses a sleek, minimal design with the same curved façade found on the PowerWave 8. In fact, at first glance, the PowerWave 10 is almost identical to its smaller sibling, the PowerWave 8. Around back and under the hood, the PowerWave 10 begins to separate itself from the 8 in many ways. 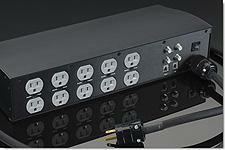 For starters, the PowerWave 10 features 10 high-current, grounded, noise-filtering surge-protected outlets. The PowerWave 10 has five individually filtered outlet banks for better isolation and performance, but as on the PowerWave 8, all of the outlets are identical in terms of performance, which is unique among audiophile and home theater power conditioners. The PowerWave 10 offers surge protection for two coaxial sources, as well as a single telephone line, and comes equipped with a high-current PowerLink Plus power cord. • With 10 total outlets at its disposal, the PowerWave 10 is well suited for most high-performance home theater or audiophile systems. • The PowerWave 10's minimal appearance is at home with a variety of systems, from mid-fi to ultra high-end, as it doesn't scream "look at me" when turned on and distract you from enjoying your system. • The PowerWave 10's effect on your system's sound and/or video performance is noticeable and welcome, lowering noise across the board and improving macro detail, as well as enhancing sharpness and color saturation. The PowerWave 10 also aids in spatial definition and top- and bottom-end control. • The PowerWave 10 provides no kind of back-up or sequential power up or down, which for some consumers is a deal-breaker. If you're in need of battery back-up or other bells and whistles, you'll have to look elsewhere and be willing to spend a bit more money. • The included PowerLink power cord is a nice bonus and a great cord, but it's a bit stiff out of the box, making cable routing and management a bit of a chore. When it comes to power conditioners, you can't throw a rock in a stereo store without hitting one these days. While your choices may be vast, know that not all power conditioners are created equal and few can match the level of performance the PowerWave 10 affords you. While it may lack some features, such as battery back-up, it more than makes up for this in its wonderful noise reduction and audio/video improvements. Highly recommended and worth checking out. Tributaries T200 Power Manager Reviewed Known more for audiophile cables, Tributaries has a rapidly expanding lineup of top performing AC power products designed for the home theater enthusiasts and mid-level audiophile. The T-200 power manager reviewed here by Brian Kahn is. Transparent Cable PowerBank 2 Power Conditioner Designed to condition your power in tight spaces like behind an LCD or plasma HDTV - the Transparent PowerBank 2 power conditioner gets a full work out from HomeTheaterReview.com's editor, Andrew Robinson. Transparent PowerWave 10 Power Conditioner For the serious audiophile and or home theater enthusiast, the Transparent PowerWave 10 offers - you guessed it - 10 identical power outlets boasting clean, quiet power in a robust package that would compliment today's AV preamps, source components and more.